Origin-of-life research strives to answer the questions how and under which circumstances the first replicating life forms emerged. Exploring billions of years in the past means that scientists rely heavily on extrapolation and assumptions to create a plausible scenario that could represent the environment on early Earth. To this end, disciplines ranging from astrobiology and geoscience to organic chemistry have to come together to contribute to the bigger picture. To honour the difficulties of prebiotic research and to contribute to the exchange of ideas across scientific disciplines, we assembled this collection. 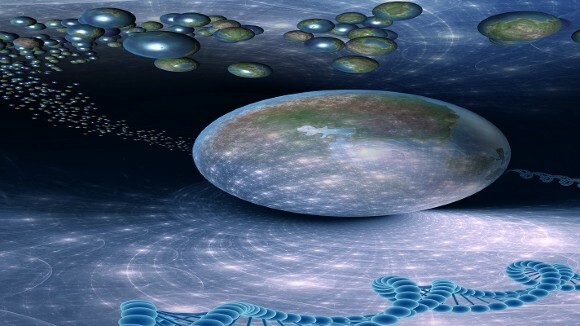 The Experimental Conditions tab contains commissioned opinion pieces (comments) on the question: What settings are plausible when investigating the origin of life, precisely, when investigating the origin of genetic material (DNA/RNA)? The other three tabs contain research articles on early Earth conditions, the origin of nucleotides and nucleosides, and the early days of biochemistry (Early Cells) published in Nature Communications. One of the questions for prebiotic chemistry is the formation of complementary base pairing systems. Here, the authors show that plausible two prebiotic heterocycles can form glycosidic bonds with ribose in water and that these spontaneously base-pair in aqueous solution. How RNA building blocks have formed on an early Earth by a continuous process is still a mystery awaiting its solution. Here, the authors report that fluctuations of physical parameters like temperature and pH could have been enough to facilitate nucleoside formation from simple starting materials. While mechanisms have been proposed for the prebiotic nucleotide synthesis, these require separate (and potentially incompatible) routes for pyrimidines and purines. Here the authors show that both of these classes of molecules can be formed by a divergent synthesis from a common prebiotic precursor. A crucial transition in the origin of life was the emergence of self-replicating RNA and its compartmentalization within protocellular structures. Here it is shown that the physicochemical properties of ice, a simple medium widespread on a temperate early earth, could have mediated this transition. Some oligomers exhibit liquid-crystal-like ordering in concentrated aqueous solutions. Here, Fraccia et al. show that this kind of ordering can further facilitate DNA ligation in a way similar to a catalytic process that arises from a hierarchical self-assembly, namely liquid crystal autocatalysis. Arabinonucleic acid (ANA) Watson-Crick base-pair with RNA/DNA and can evolve to display enzyme-like function. Here, the authors now identify a prebiotic pathway that yields the complete set of Watson-Crick base-pairing purine and pyrimidine ANA nucleosides. Sugars are known to form from the UV photoprocessing of ices under astrophysical conditions. Here, the authors report the detection of deoxyribose, the sugar of DNA, and other deoxysugars from the UV photoprocessing of H2O:CH3OH ice mixtures, which are compared with materials from carbonaceous meteorites. Early molecules of life likely served both as templates and catalysts, raising the question of how functionally distinct genomes and enzymes arose. Here, the authors show that conflict between evolution at the molecular and cellular levels can drive functional differentiation of the two strands of self-replicating molecules and lead to copy number differences between the two. The synthetic production of model protocells, which represent potential intermediates between nonliving material and living cells, may help to explain the origin of cellular life. Here, Kurihara et al. develop a giant vesicle-based model protocell that is able to self-proliferate recursively in response to external stimuli. Early cells likely consisted of fatty acid vesicles enclosing magnesium-dependent ribozymes. Here, the authors show that fatty acid derivatives can form vesicles that, unlike those formed from only unmodified fatty acids, are stable in the presence of magnesium and could support ribozyme catalysis. Phase separation of mixtures of oppositely charged polymers provides a simple and direct route to compartmentalisation via coacervation. Here authors demonstrate that a coacervate microenvironment supports RNA catalysis whilst selectively sequestering RNA based on length. The citric acid cycle (TCA) is a fundamental metabolic pathway to release stored energy in living organisms. Here, the authors report two linked cycles of reactions that each oxidize glyoxylate into CO2 and generate intermediates shared with the modern TCA cycle, shedding light into a plausible TCA protometabolism. Selection and persistence of chemical non-equilibrium species is crucial for the emergence of life and the exact mechanisms remain elusive. Here the authors show that phase separation is an efficient way to control selection of chemical species when primitive carboxylic acids are brought out-of-equilibrium by high-energy condensing agents. The means by which planktonic cyanobacteria were able to persist through the Archean despite high fluxes of UV radiation are unclear. Here, the authors show that Fe(III)-Si rich precipitates in the Archean photic zone could have provided early planktonic cyanobacteria an effective shield against UV-C radiation. The Earth’s core has lower density than pure iron and many studies have looked into which light elements may be present. The authors here carry out in situ high pressure and temperature neutron experiments indicating that hydrogen may have been the first light element to dissolve into the iron core. The concentration of Ni and Cr of the continental crust cannot be explained by formation models involving differentiated magmatic rocks. Here, the authors show that hydrothermal alteration and chemical weathering of ultramafic rock compensates for the low Ni and Cr concentrations of island arc-type magmatic rocks. Extraterrestrial sources may have provided prebiotic phosphorus to the early Earth. Here, the authors investigate the potential of phosphine-doped astrochemical analog ices to form phosphorus oxoacids as precursors to more complex prebiotic compounds. There is still much debate on early Earth geochemical conditions affecting the chemistry of simple synthons that originated life. Here, the authors report an uninterrupted multistep synthetic route to 2-aminooxazole by means of flow chemistry equipment, mimicking a plausible early Earth (geo)chemical scenario. Clay is thought to have played a part in the origin of life. Here, the authors show that layered double hydroxides, a type of clay little studied despite its presumed prevalence on the early Earth, can facilitate the formation of small proteins. Typically, in order to form large peptides, complex procedures or activating agents are required. Here, the authors show that simple aqueous conditions with dehydration-hydration cycles are sufficient for the oligomerization of amino acids into peptides (up to 20 amino acids long) in yields of up to 50%. Phosphorus is presumed to have been a limiting nutrient in the Archean ocean due to binding to iron oxides. Here, the authors show the heating of iron with phosphate results in the reduction of phosphate to the ion phosphite, which is solubilized and ameliorates the issue of a low Archean phosphorus supply. The composition of the early Earth’s atmosphere remains unclear. Here, the authors using fluid inclusions trapped within quartz crystals show that at 3.3 Ga the atmosphere had a lower 129Xe excess than today, and suggest that comets may have brought xenon to the Earth’s atmosphere during terrestrial accretion. How the Early Earth transitioned from an abiotic world to the modern biogeochemical Earth system remains unclear. Here, the authors show that colonization of a minor fraction of Archean landmasses by topsoil bacteria would have been enough to match the modern land-to-ocean nitrogen export of ammonium and nitrate. Some of the earliest life on Earth flourished in terrestrial hot springs. Here, the authors present evidence for ca. 3.5 Ga hot spring deposits from the Dresser Formation, Pilbara Craton, Australia, that host some of the earliest known life in the form of stromatolites and other microbial biosignatures.